If you haven't been able to make a trip to the north Georgia Mountains to check out the fall foliage this year, you're running out of time. In the last leaf report by the Georgia Forestry Commission, northeast Georgia and the higher elevations have peaked. The leaves in those areas are turning brown and falling off. Northwest and central Georgia, however, still have a colorful show ongoing. 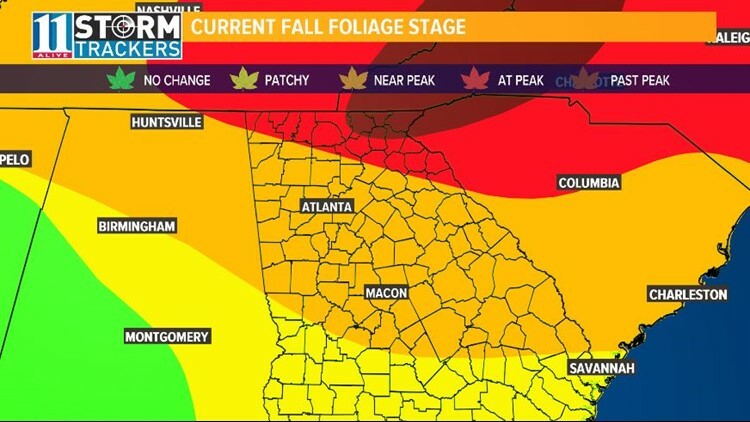 Last week was the arrival of the peak in these areas, but the colors continue to evolve with 40-80% or greater change. GFC notes that this year the colors are a little 'muted' but neon reds and fluorescent yellows are shinning. Even more good news, there are still trees that haven't turned from green yet, so further development is possible for the next few weeks.